The Vertool 12e Polisher is a small form factor Dual Action Polisher designed specifically for use with spot pads to take detailing to the next level. 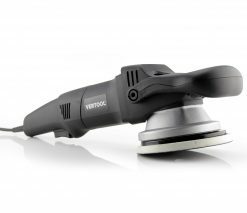 The Vertool 12e comes complete with a 75mm backing plate and will fit all 3 & 4″ polishing pads and accessories making this the ideal polisher for tackling the more intricate polishing tasks. Using a extremely smooth 700w motor the Vertool 12e really packs a punch and importantly it doesn’t bog down under load. When this is combined with the large 12mm throw it makes this an extremely versatile car polisher with superior performance and faster results. All of this is packed into a compact, lightweight at only 1.8kg body, making this machine the perfect choice for tackling all smaller and more intricate areas of polishing as well as wet sanding. The machine is also supplied complete with a white polishing pad to get you up and running.